Boku Slots love to check out the latest and greatest in online slot games and although Epic Gems isn’t like your standard slot, we think it is just as exciting. The team at Gamevy have taken what is essentially an old school PC game called Minesweeper and developed it into a modern online casino game with a twist. This game is relatively simple in design with zero pay lines and no reels, but don’t let that put you off. It has a very impressive RTP of 96%, made even better by the brilliant cash out option available throughout the game. You make your stake and then just start to click on gems, winning (or losing) as you go. There are 40 gems on the screen, 36 of which are good gems that will win you money and four bad gems which won’t win you a thing. Each good gem disappears into the vortex at the side of the page. For every good gem selected there is an amount added to the pot. The aim is to select all of the good gems to win the jackpot or cash out before you hit a mine, as if you do all is lost and you start again. Bet Amounts – The minimum bet amount is £1 and the maximum is £100 on this game. The higher your stake the higher the prize fund available. Once you have selected a minimum of 7 good gems, you will have doubled your money no matter the stake selected. Your only choice then is whether to carry on or cash out. Cash Out – As you play along with the prize pot building, you have the option of cashing out your game. This means that if you don’t want to take the chance of hitting the Mine Gems which blow the game and your winnings, you can quit whilst you are ahead. 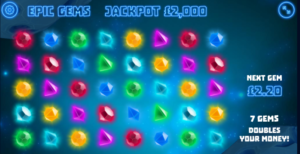 Mine Gems – If you hit one of the four mine gems your game is over and you lose your stake, and any money in the prize pot. The aim of the game is to avoid these gems where possible. Click or Swipe – Whilst this isn’t necessarily something that will earn the big bucks, we think it is a great feature. You can choose to select each gem individually, or if you are feeling brave you can swipe along a row or up/down a column to remove multiple gems at once. This will either work in your favour or it won’t, as you run the risk of hitting a mine gem a lot quicker with the swipe option. How brave are you feeling, is the question you need to ask yourself at the beginning of your game? Whilst this is not your usual slot themed game, we love it non-the less. The sparkle of the gems and the swirling space vortex just draws you in to begin with. The fact that you can reduce the amount of your total bet or increase it is brilliant. Add to that fact that as long as you remove 7 good gems you have doubled your stake and can cash out as a winner. Gamevy have created an absolutely fantastic game with Epic Gems and it has fast become popular with the online community, and we can see why.